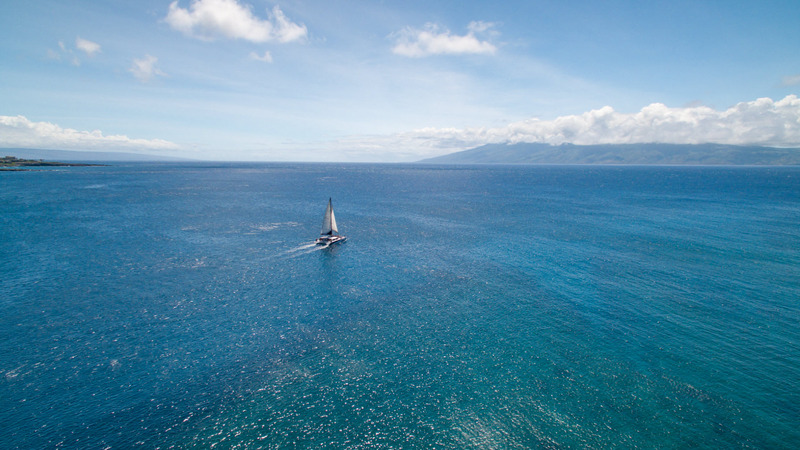 While snorkeling along West Maui’s coastline, experience warm waters abundant with sea life. 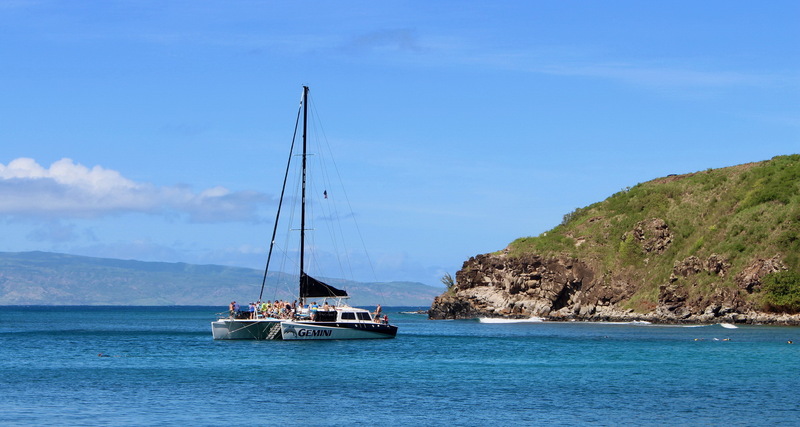 You will see a variety of tropical fish, and if you’re lucky an endangered Hawaiian Green Sea turtle ‘Honu’. 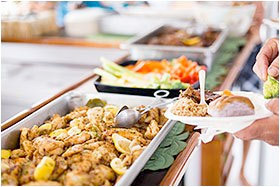 A hot buffet lunch is served and our complimentary bar is open. 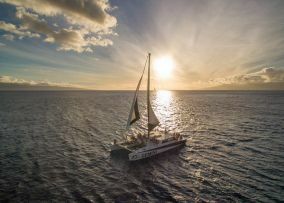 Relax as Gemini’s crew set sail for two hours of smooth and exciting Tradewind sailing with phenomenal views of West Maui’s mountains, Molokai and Lanai. Sip a Mai Tai or a Maui Brewed Beer, and lounge on Gemini’s decks or trampolines, as the sun sets on another perfect day in paradise. 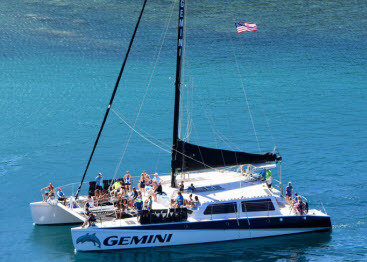 From December 15 to April 15 Gemini offers two daily Whale Watches. 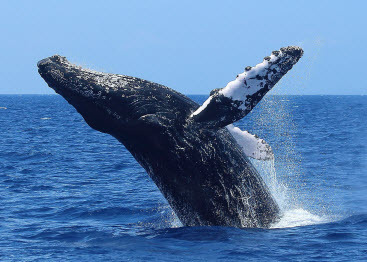 A morning Whale watch and an Afternoon Whale Watch. 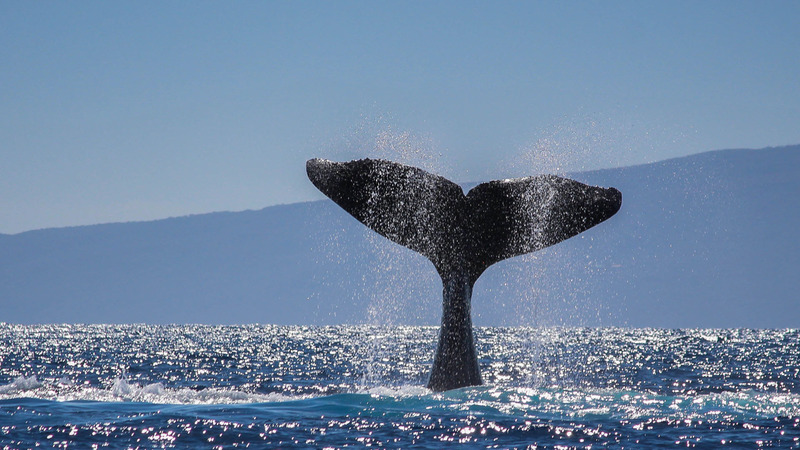 Our Professional Marine Naturalists share intriguing information and up-to date facts about the Whales as our guests listen to ‘Whale Songs’ live on Gemini’s hydrophone. 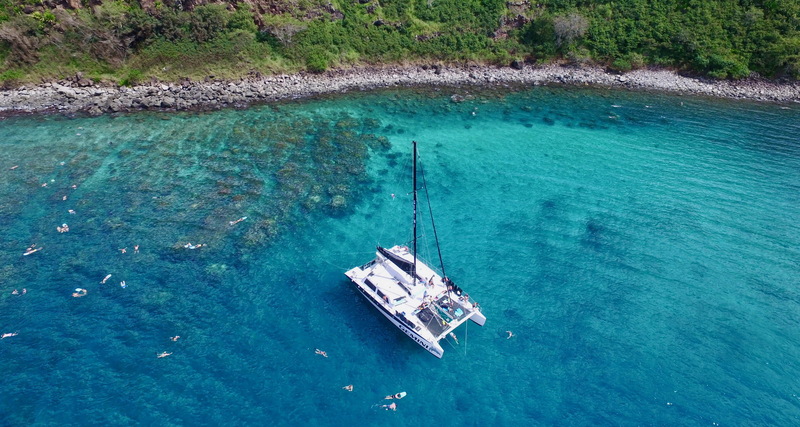 Island Style BBQ Chicken, Kalua Pulled Pork, Hawaiian Fried Rice, Assorted Veggie Platter with Chef’s Ranch Dip, Freshly Baked Rolls, Peanut Butter & Jelly, Freshly Baked Chocolate Chip and Macadamia Nut Cookies. 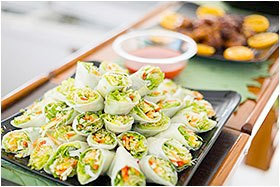 Island Style BBQ Chicken, Vegetarian Summer Rolls with Sweet Thai Chili Sauce, Island Fresh Crudités Tray with Chef’s Ranch Dip, Domestic Cheese and Cracker Platter, Tortilla Chips with Salsa Fresca and Guacamole. 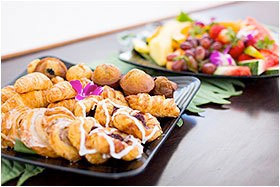 Homemade Cinnamon Rolls with Butter, Mini Muffins, Pastries, Assorted Cream Cheeses, Peanut Butter & Jelly, Tropical Fruit Platter with Seasonal Fresh Fruits, Melons and Pineapple, Freshly-brewed Maui Coffee and Tropical Juices. Pepsi, Diet Pepsi, Sierra Mist, Root Beer, Ginger Ale, Lemonade, Cranberry Juice, Filtered Water, Soda, Tonic, and Passion-Orange-Guava POG – Maui’s favorite! Gemini Mai Tais, Maui Brewing Co. Bikini Blonde Lager and Big Swell IPA, Bud Light, Le Terre Chardonnay, Kenwood Champagne, Skyy Vodka, Potter’s Light and Dark Rum. 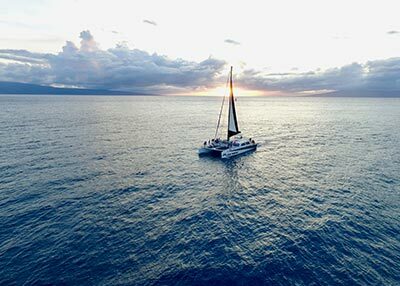 Begin your Maui Snorkel adventure with the sensation of your bare feet slipping into the warm sands at Ka‘anapali Beach, Maui. 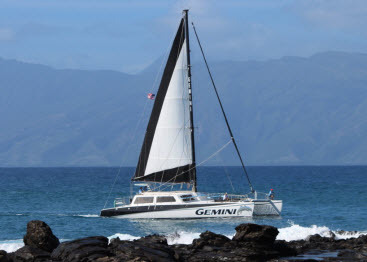 Walk down a few feet to meet Gemini, our luxurious 64’ catamaran and her friendly, professional crew who will be on the beach ready to welcome you aboard. 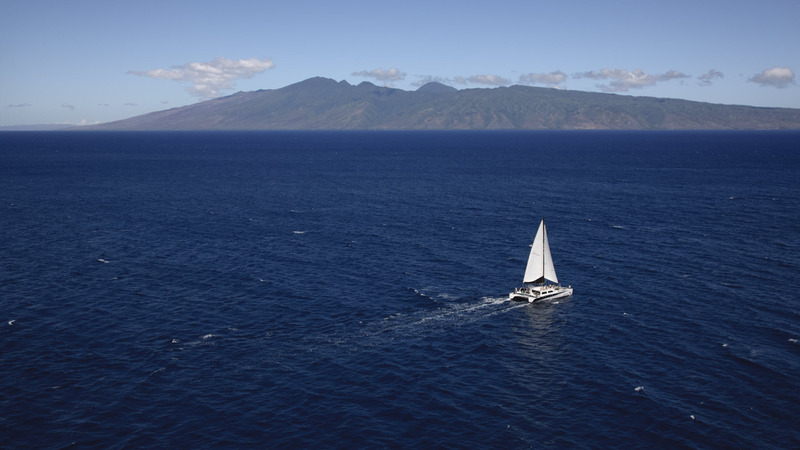 With ample seating in sun or shade, exposed to the gentle elements or sheltered by the spacious cabin, prepare to relax and enjoy your most memorable Maui day. With Snorkel Sailing Adventures and seasonal Sunset Sails and Whale Watches, Gemini and her crew will always show you the best of times. 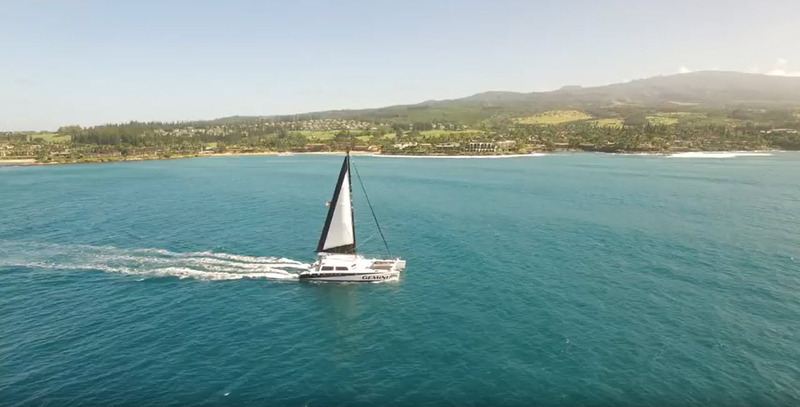 Enjoy delicious catering by Westin Maui Resort & Spa and an all-inclusive complimentary bar onboard, we will deliver you back to the warm sands of Ka‘anapali with a well fed body, mind and spirit … and we’ll look forward to your return! 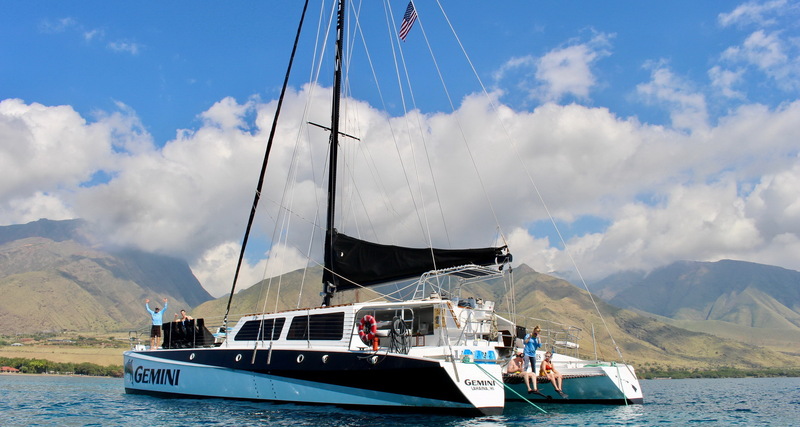 Reserve your Maui snorkel or other boat tour today! 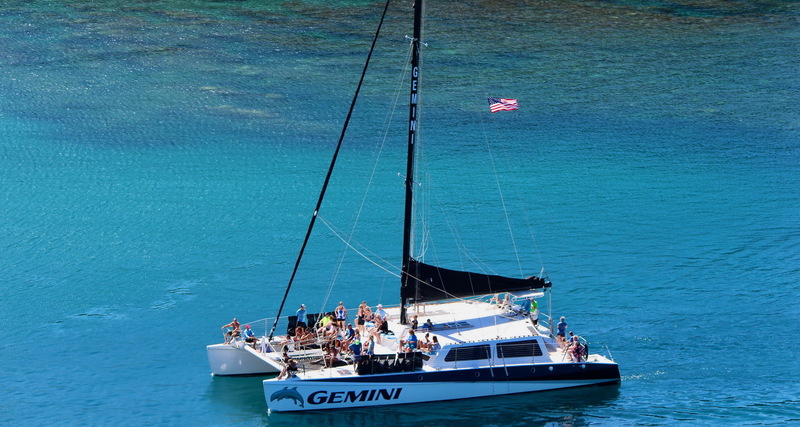 "Our entire family has enjoyed sailing on the Gemini for almost 20 years now. 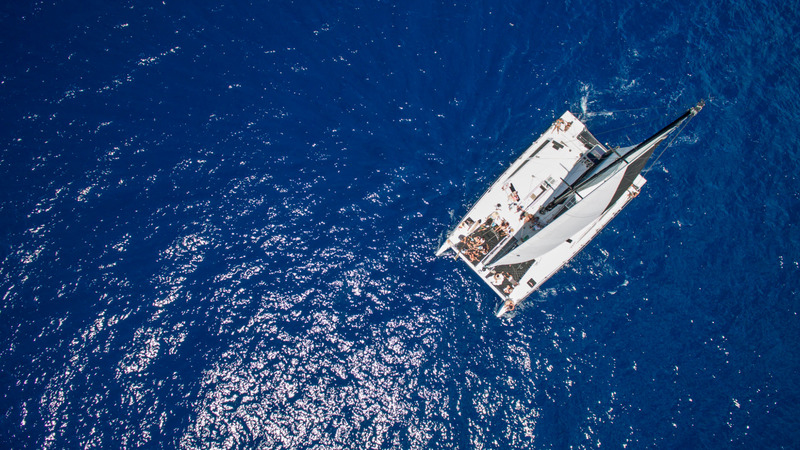 The crew make sure we always have a great time, learn something new and of course experience a smooth ride on the Pacific. 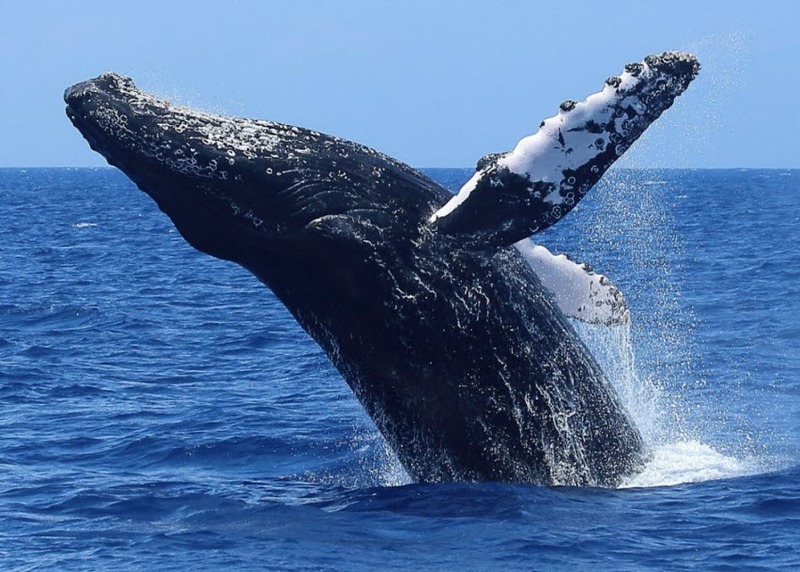 It is annually one of our vacation highlights."